Patrick Ness is quickly becoming one of my two or three favorite authors. Everything he produces contains not only a well-thought-out plot, but also seems to come from a unique perspective that other authors haven’t approached before. Whether it’s hearing the thoughts of a dog (Knife of Never Letting Go) a book where you’re not even sure what the “monster” is (The Monster Calls) or whatever it was that happened to me in More Than This, Patrick Ness just never lets me sit still and read. He has to show me something different. And this book is really all about “unique perspective,” in several ways. There is a typical YA thriller going on in the background someplace, but we’re just learning about the regular kids: the ones with no superpowers who are not the Chosen One and aren’t super-spies either. And guess what? These kids have their own lives, too. They have problems. They’re trying to navigate family, peers, and even themselves. Who needs an adventure with aliens when you’re trying, like every other teen, to figure own your own life in this weird little world? 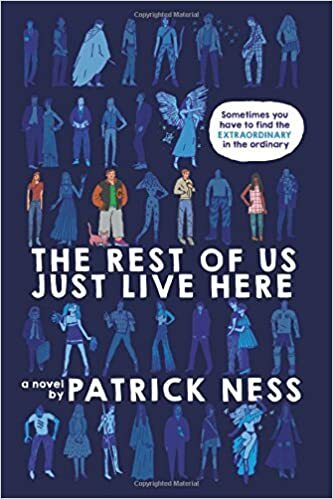 Patrick Ness slips so many interesting philosophical nuggets into this narrative as he tells the tale of these “regular” kids. I want every person in my life who works with teens (teachers, parents, etc.) to read this book just because of these glimpses into the heads of these teens. I found their lives fascinating, and the way their lives fit within the framework of their unique home town and the stories happening in the background of the town… This is a true five-star book from Mr. Ness… Again!